…a spirited, dedicated guitarist and composer whose creative reach extends through and beyond the jazz idiom. She has remained loyal to the true nature of jazz improvisation by telling great stories on her instrument; her mature phrasing and emotional power are striking. she has performed with a variety of musical groups, from jazz chamber ensembles and big bands to regular appearances with her own groups at such venues as Birdland, Joe’s Pub, and The Blue Note, to name a few. 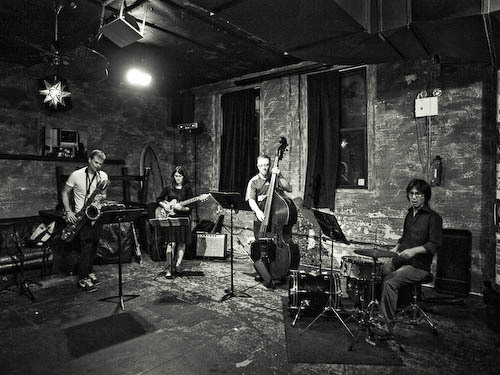 Amanda’s current projects includes her quartet (aka Deathblow), a jazz and improvisational music ensemble that combines free-bop sensibilities with through-composed pieces equal parts textural, adventurous, and whimsical. With alto/baritone saxophonist Michaël Attias, bassist Sean Conly, and drummer Satoshi Takeishi, this quartet performs a mix of Amanda’s original compositions and modern twists on classic and obscure jazz repertoire. Their debut CD, I Think I’ll Keep You, is on the Japanese label LateSet Records. Amanda also co-leads the quintet Playdate with old friends Noah Baerman (piano) and Wayne Escoffery (tenor saxophone) and new friends Henry Lugo (bass) and Vinnie Sperrazza. They can be seen performing around New York City and their debut recording has been released on Posi-Tone Records in late 2009. Amanda is also a resident musician at Congregation B’nai Jeshurun in New York City, and appears on both of their recordings, Halailah Hazeh: The music of Pesah and Teki Yah: The High Holy Days. She is currently working on a suite of music using text from the Pirke Avot, a collection of rabbinical teachings compiled in the third century C.E., sung in Hebrew and Aramaic by Israel vocalist Ayelet Rose Gottlieb and accompanied by Monaco on electric guitar, with Daphna Mor on recorders and nay, Sean Conly on bass, and Satoshi Takeishi on percussion. An educator since 1990, Amanda has served on the faculty of New School University, and presently teaches at the National Guitar Workshop, on the innovative web site WorkshopLive, and at Berklee College of Music. Her book, Jazz Guitar for the Absolute Beginner (Alfred Publishing), is available worldwide. Amanda received her M.A.from The City College of New York in 2008. In her undergraduate years, Amanda studied with Ted Dunbar, Kenny Barron, Rufus Reid and Harold Mabern. She received her B.Mus from William Paterson University. 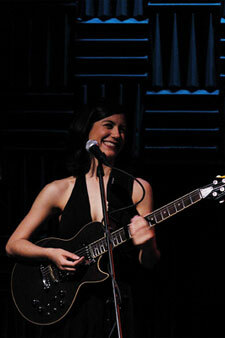 Amanda plays a Brian Moore iGuitar and D’Addario Strings. Probably Kind of Blue. I started attending a school for the arts in my junior year of high school, and that was the first jazz record my teacher assigned. It was also the first jazz record I had ever heard at that point, and I promptly wore the cassette out after countless listenings. Elements of Style, Exercises in Surprise, by the Vandermark 5. I find Ken Vandermark's music to be very exciting and creative, incredibly loose yet structured. The first solo I learned from a record was Miles Davis' solo on "So What," and I can still play it. It was the first class assignment I had at the arts high school I went to. We all had to learn "So What" and then we were paired off to transcribe the rest of Miles' solos on the record. It was a really great introduction to jazz, as it was the first time I had ever had any experience listening to and playing it. My quartet CD, Amanda Monaco 4. We rehearsed every week for six months, then went into the Bennett Studios in Englewood, New Jersey, and knocked the whole thing out in five hours. The engineer set us up in a circle, just the way we’d rehearsed, and we recorded live to two-track. We had a blast, and the CD came out great. Live gigs have an audience to connect with; studio playing is where you think more about the product you'll be delivering to your audience. A good gig is when the music really gets you in that beautiful groove of a way; a bad gig is when you just don't feel the musicians are communicating with each other. And of course, it's always an annoying gig when the audience is disrespectful — since when is it acceptable to scream over any musical performance? A good guitar stays in tune from song to song and has good intonation. A good guitar doesn't make you fight it to make music on it. Not really, though there are gigs that I play entirely on acoustic guitar that are very different from what I play with my quartet. Definitely on electric, though I don't really change my style so much from one to the other. I think I do. Even when it's not my guitar, I make a point of trying to play how I play, not really thinking, "Oh, this guitar is different." I'd love to collaborate with Matt Wilson. He's one of the most creative musicians I know. Also, Ken Vandermark — I love what he's writing and playing these days. 12. What dead artist (music, or other arts) would you like to have collaborated with? Since my teens, I’d always wanted to play in Joe Henderson's band. When he died without that happening, I was sad. 13. What's your latest project about (2011)? 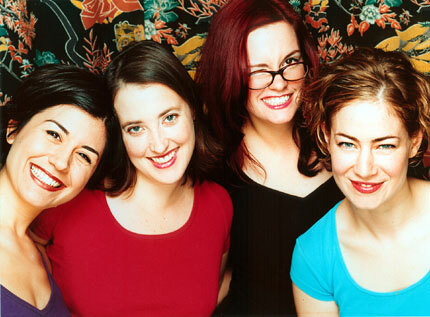 My latest projects are the ones I've devoted a lot of time to over the past several years — my all-female "cocktail pop" quartet the Lascivious Biddies, and my jazz quartet Amanda Monaco 4. Both involve a lot of room to grow. With the Biddies, someone brings in a new song — either original or something obscure — and we rearrange it, throw in some four-part harmonies, and make it a group effort. In my quartet, we play all original music and try playing it different ways, too. Clinic at 5 p.m., Jam Session 7-10 p.m.
QJOG JAM SESSION AT FLUSHING TOWN HALL!